Guys, this is my 100th post. How exciting! Hummingbird High is getting all growed up. Pretty cool right? Candles and all. Some people say that a cast iron skillet is really the only cookware you need. It works on the stovetop, in the oven, and outdoors in an open flame. You can use it for roasting, frying, whatever. But aside from providing a unique aesthetic, the skillet doubles as a bowl during the baking process. 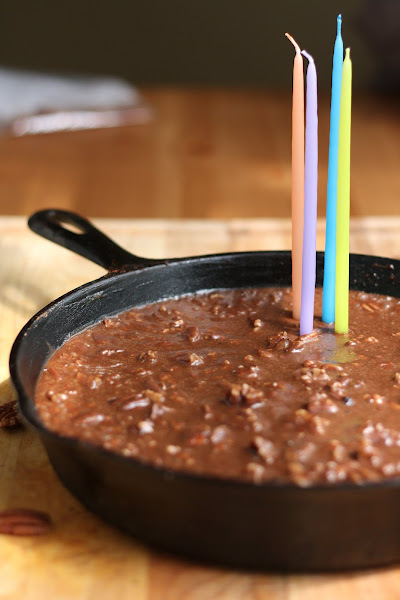 So you can pretty much mix your ingredients in the skillet, and then stick them in the oven. How cool is that? This recipe is basically a one-bowl cake. Way to cut down cleaning time, eh? I know I'm always down with that. Now, before I share this awesome recipe with you, I wanted to point out a few things. You may have noticed a few changes around here. The biggest change is the blog's sidebar is now a right-hand sidebar. I have mixed feelings about this -- I've always favored a left-hand sidebar, finding it more natural to have the main content to the right with additional notes to the left. However, I started to notice more and more though, that most major blogs had their sidebar to the right. I thought that maybe I was in the minority and that it was an aesthetic choice, but it turns out not the case. Why? Well, you may have also noticed that my blog now has... ads. Yep, ads. I've monetized. I resisted monetizing my blog for a long time because, hey, who likes annoying ads right? But the fact of the matter is, I'm a lowly intern earning a surprisingly grim hourly wage and I could really use the extra income. I really hope that the ads don't bother anybody too much. In any case, fun fact -- did you know that it's near impossible to have a left-sided sidebar that incorporates a 300 x 200 banner ad? I spent the last few days playing around with my layout in order to keep the left-side sidebar, but to no avail. No wonder all bloggers have right-hand sidebars. And I guess I've made the leap too. Anyway, sorry for that interruption. Let's get back to what everybody really cares about. CAKE! Although this recipe is adapted from Willow Bird Baking's Gooey Chocolate Skillet Sundae recipe, but to be honest, it reminded me a lot of The Pioneer Woman's Texas Sheet Cake Recipe. This is a great alternative recipe to those who want sheetcake but don't have the monsterously sized jelly roll pan that the Pioneer Woman's recipe requires. 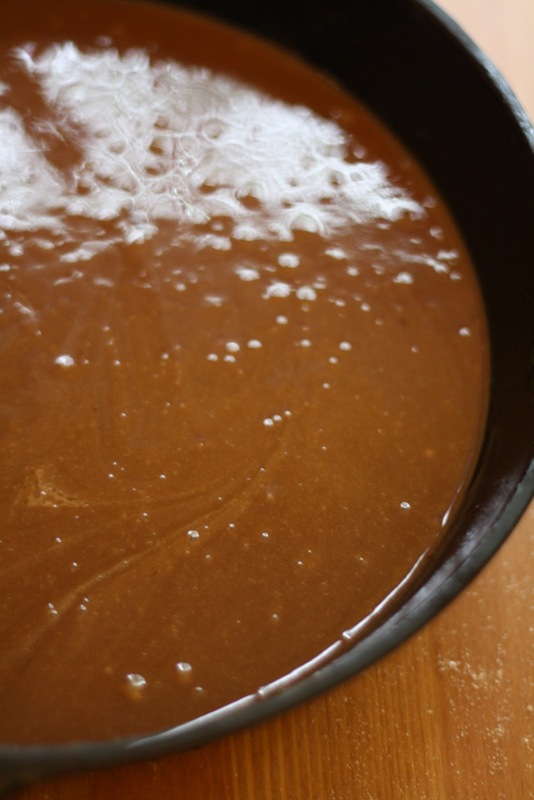 The recipe is pretty simple but since it basically requires a lot of fat, the mixing process can be a little tricky. 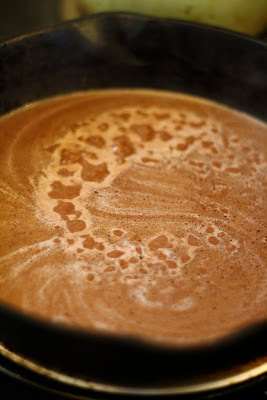 There are also some weird steps that involve boiling cocoa powder and butter. I've included different pictures in the recipe so you can reference what the batter looks like at that point of the baking process. Soft, gooey, and light, this chocolate cake is a guaranteed crowd pleaser. 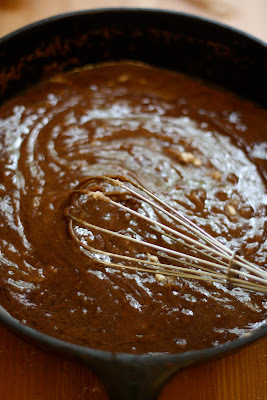 A perfect recipe to mark my blog's 100th post. In a large bowl, whisk together 1 cup flour, 1 cup sugar, 1/2 teaspoon baking soda, and a dash of salt together. Set aside. I found the most effective way of mixing was to actually fold the ingredients together. That way, I didn't get batter running out the sides of the skillet from violent mixing. Once the batter is ready, bake the skillet in the preheated oven for about 15-20 minutes or until a toothpick comes out with just a few moist crumbs. Let rest on a cooling rack. As the cake starts to cool, make the frosting. 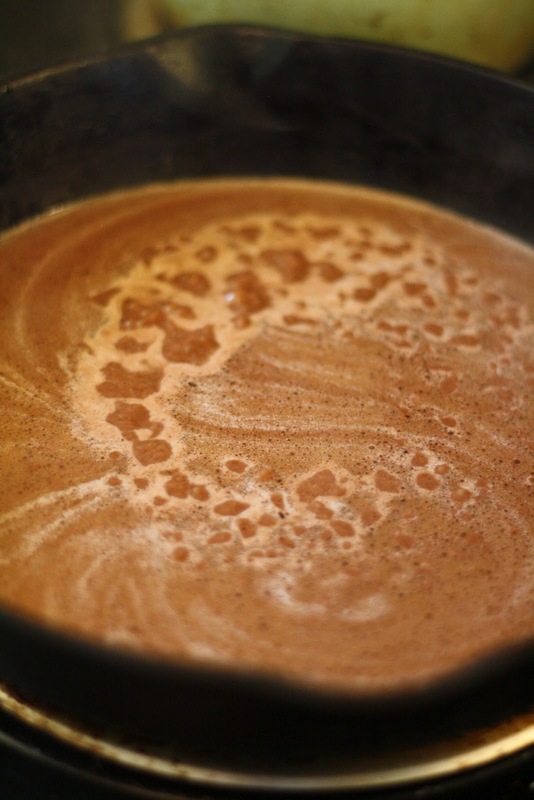 In a medium saucepan, melt 4 tablespoons butter. 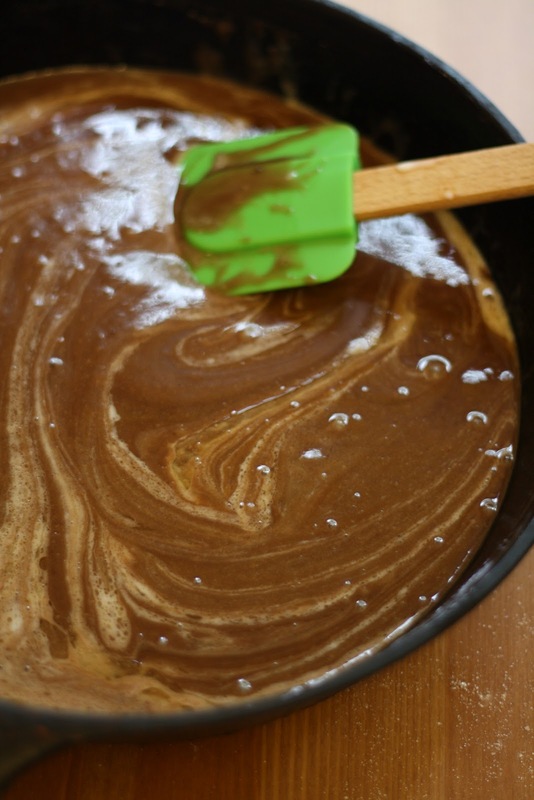 Once the butter has melted, add 2 tablespoons cocoa powder and 4 tablespoons milk, using a rubber spatula to combine the ingredients. 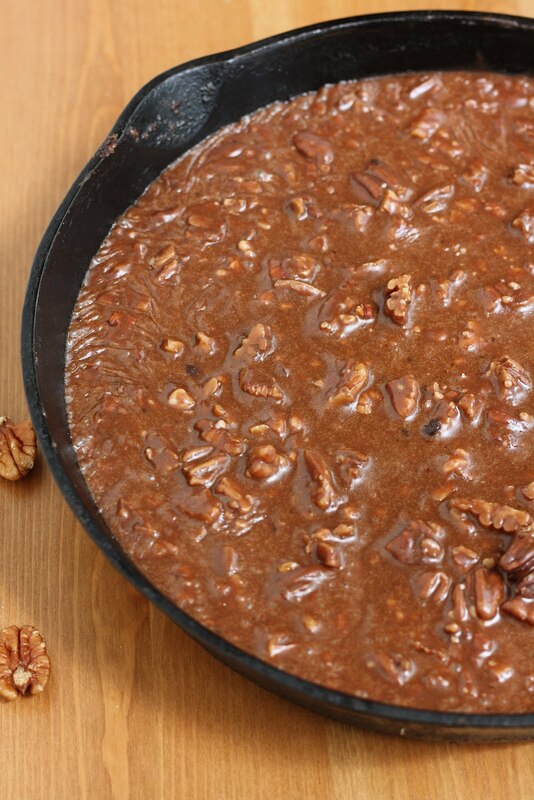 Remove from heat and add 2 cups powdered sugar, 1/2 cup chopped pecans, and 1/2 teaspoon vanilla. Stir to combine, making sure that all the powdered sugar lumps have been disintegrated by the chopped pecans. Once the frosting is ready, pour over the warm cake and spread with a spatula. The frosting will initially appear to liquidy, but will harden as the cake cools. Just found your blog. 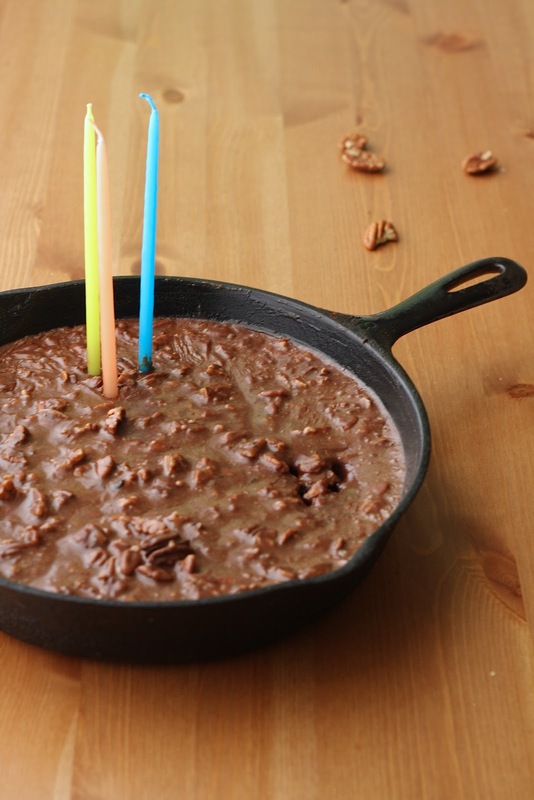 I am going to make this since I love using my cast iron skillet and Texas sheet cake. Thanks for posting! Love your beautiful version! 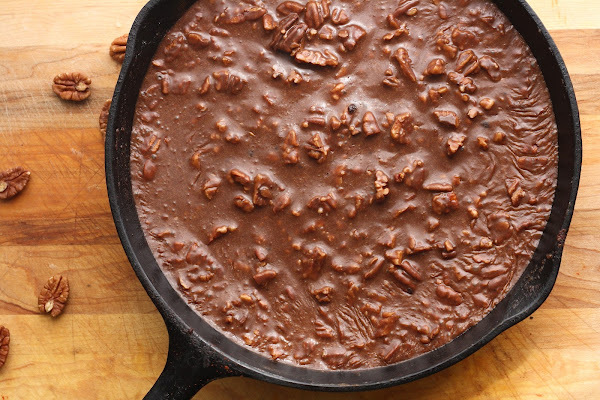 It is Texas Sheet Cake, but the recipe has been around before Pioneer Woman -- we made it when I was a little girl :) I thought a skillet-sized version would be just about perfect! So glad you enjoyed it! OMG thats look awesome and yummy! Clever idea, I'll have to try this. Mama mia! Nothing better than eating cake outa a skillet. Happy 100th post! This looks terrific! Do you have a link to print just recipe? I didn't see it on this post.